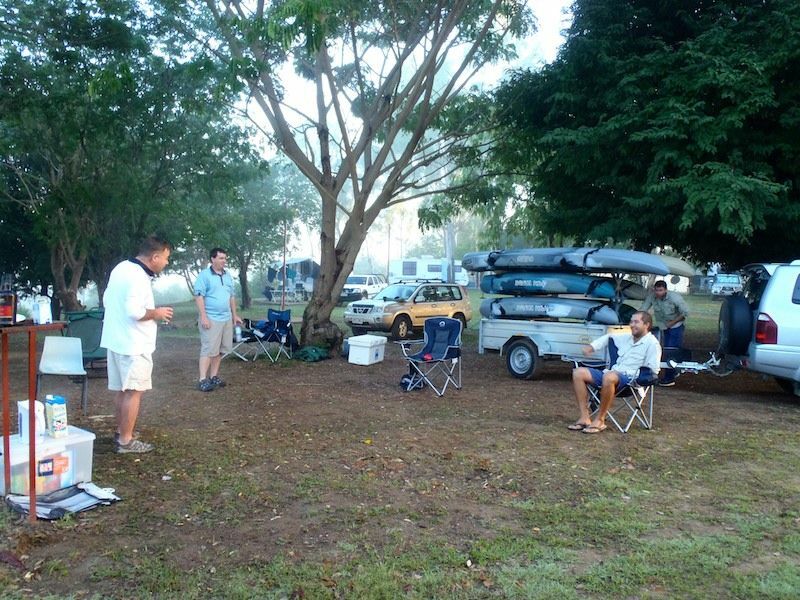 Last weekend forum regular and All Aussie Shock Leader manufacturer Phil Lawlor arranged for a bunch of us to get together and kayak the Burdekin. Phil has just put together a trailer of 6 extreme kayaks. 4 of which are the bandits and 2 the longer outlaw. Phil announced the idea on the forum a couple of weeks ago, and from there all arrangements were made online. At one stage we had 9 members planning to attend the trip, but at the last moment we were down to 6. The members who attended included Phil Lawlor, Goddy, andrewgleeson84, Li'lDave, Snake and myself (sailfish). Most of us had only ever chatted online in the forum, so this was also a great chance to get together in person. 4 of us headed off in my car about 5.30 Friday afternoon, Andrew was already there with his family and Dave was not far behind finishing work a little later. Plan was to camp the night at the Bivouac Junction holiday park and head out Saturday morning. We had been told about some very spectacular Sooty fishing along this stretch of river, but I was sceptical. I have never been overly successful with Sooties, often only catching 2 or 3 in a morning session. And with 7 kayaks following each other down the river, I personally wasn't expecting much more than a leisurely paddle and beautiful views. But I couldn't have been more wrong! 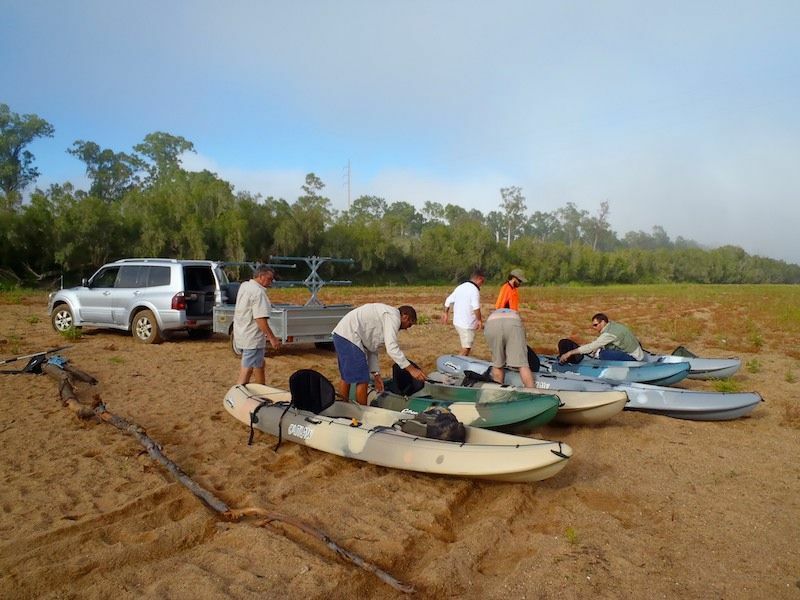 First fish came from the bank on the opposite side to where we launched, most of us hadn't even got a line wet! Even my fish came within the first half dozen casts. From here we slowly worked out way down through some very spectacular country (and a few scary rapids!). According to the locals we had experienced one of the quieter days, but I had seen some of the best Sootie fishing ever. And we did find some bigger fish too. I think my tally was about 10 fish for the morning, and a couple of the guys did better than that. We had to have seen over 50 between the 7 of us fishing. 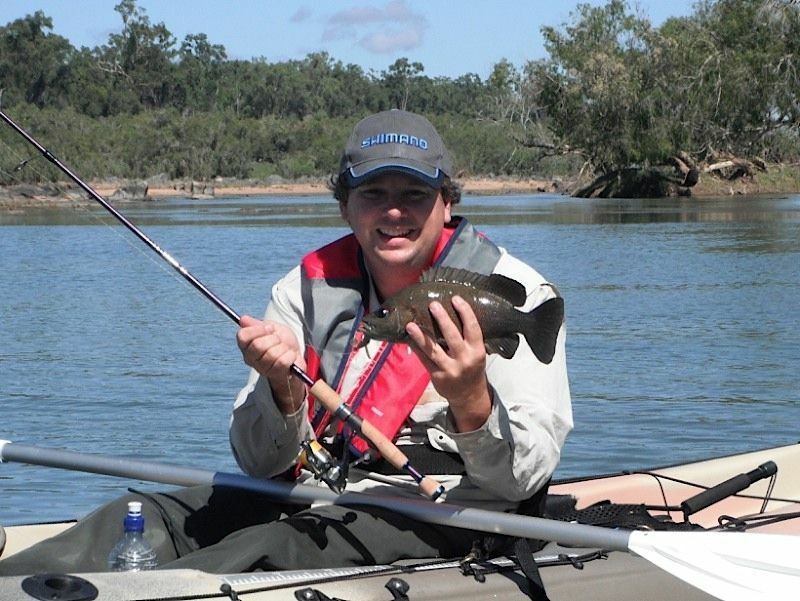 The biggest of the fish were around the 35cm mark, but on the light gear all the fish put up a great fight. 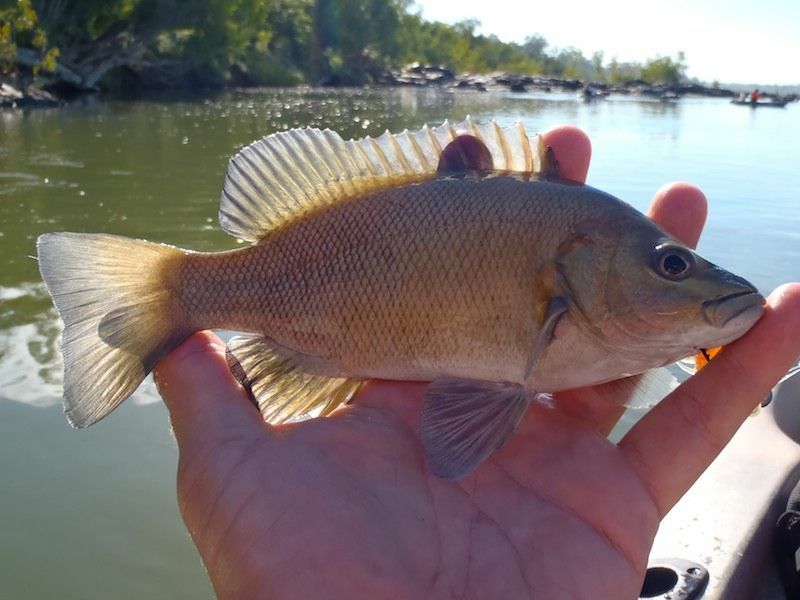 If you haven't fishing for Sooty Grunter before, they are a bit like a fresh water version of a Mangrove Jack. They hit hard and dive for cover quick. It didn't seem to matter what lure was used, they all caught fish. I used mainly 70mm Squidgie fish rigged on a 1/0 worm hook and '00' ball sinker. But small hard bodies and spinner baits also accounted for plenty of fish. Dave got the 4wt fly rod out for a while, but unfortunatly didn't manage one on it. But he nailed a few on a small squidgie wriggler. I got all my fish casting around structure. The best structure was the rocks and timber sitting in the faster flowing sections of the river. The fish would sit in the back of the structure out of the flow waiting for food to come past. Some places like this we pulled up to 4 or 5 fish from the one spot. 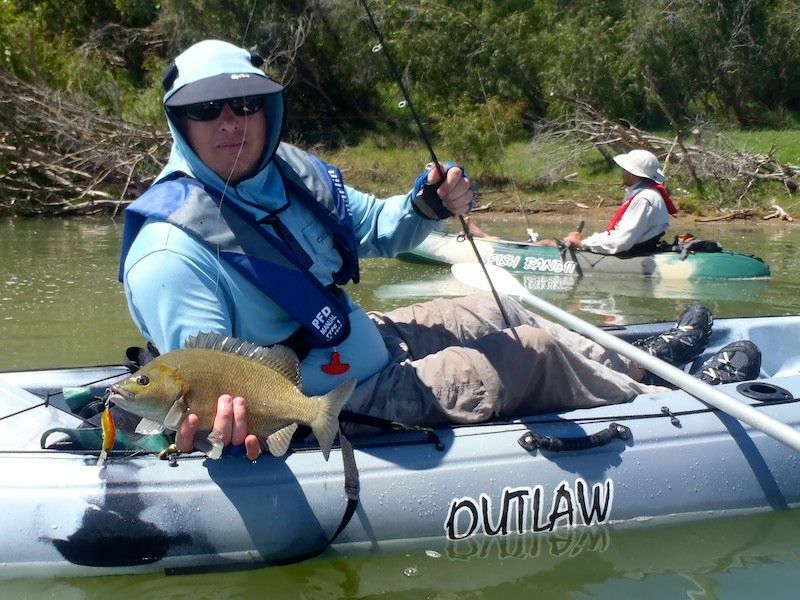 But a couple of the guys got their best fish simply 'trolling' a small diving hard body behind the kayak as they paddled along! 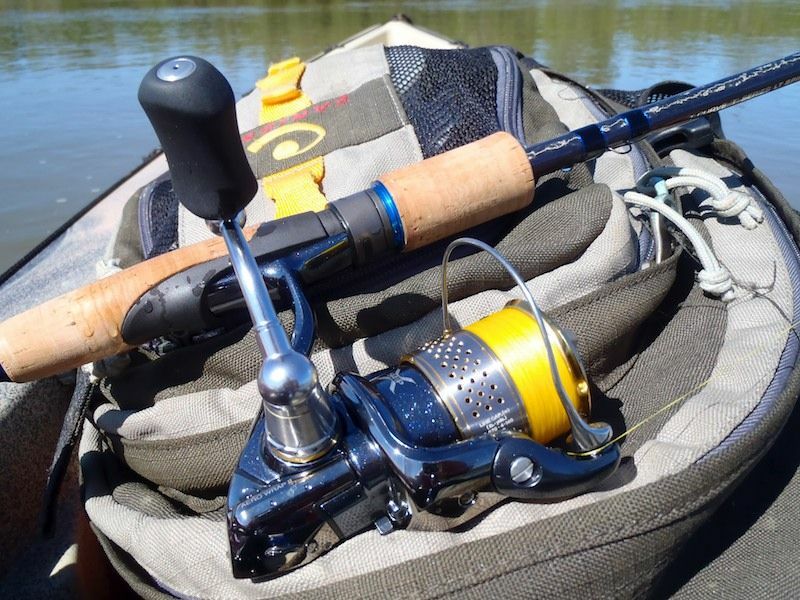 On this trip I had the opportunity to test out a new Shimano Stella 1000fe and T-cureve 661 2-5kg for the first time. The 'fe' is new for 2011. I had it spooled with 8lb Power Pro and it handled this type of fishing with ease. This is by far the best reel I have ever used, and if money is no problem its clearly one to own. I will be using this setup a lot in the coming weeks, and will eventually write a review on my thoughts. But to keep costs down, a Shimano Stratic 1000 Ci4 on a light Jewel rod would also be a pleasure to use. We finished up back at camp about 1pm. Packed up and a quick shower and we were on our way home again. This was a great trip and some pretty good fishing. Phil plans to repeat the trip again in the near future, so if you are keen keep an eye out for the announcement in the forum.